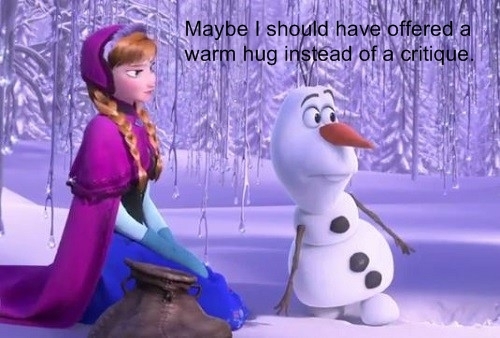 Warm hugs are great, that’s why we begin every critique with a positive comment. We hope to encourage every writer, no matter the skill level. Once, many years ago, long before you or your mother or your grandmother was even a possibility, there was a distant realm full of beautiful things. The land itself was full of shining waterfalls and emerald forests, crashing ocean waves and majestic mountains. And the beasts of that land, though no more magical than those you and I see every day, were faster, fairer, and friendlier than any found in the lands beyond. It is said that when the folk of that land first awoke from their long slumber, they saw all that was and would be, from the northern snows to the southern jungles, the western mountains to the eastern seas. And love of the land set a song in their hearts, filling their ears and loosening their tongues. Perhaps there is some truth in this legend, for the realm was known for the simple joys of their songs. The craftsmen of that realm were honored above all others. From the journeyman to the youngest apprentice, all who wove or spun or built or carved or forged lived with the land, and loved the land, and the love of the land was in their hands, so that nothing crude or common could be found in all their dwellings. And the greatest masters, those who loved best, were given the title of Handsmen and sat in honor to serve the land. Of the Handsmen—not often, perhaps once in the time it takes a forgotten nut to grow into an oak, fall, and be crafted to a fine home—one might be asked to serve as leader, the Maker of the realm. In the days of my tale, the Maker was a carver, with more scars and scratches on his hands than on the wood he polished and waxed. He was called Yew in the custom of the Handsmen, though he had been born Isleen. His wife Maed loved rather the small blossoms and soft mosses that grew amidst the roots of the great trees, but she was dead these six years and more from a fever no herb could cure. Yew and Maed had four children together, three sons and one daughter, but the boys perished in the same plague that killed their mother. Only the eldest, Carlin, survived. But the fever left her eyes weak, unable to bear the strain of fine work. Perhaps she could have served as an apprentice, for her fingers could find any flaw in wood or fabric, yet she would rather work not than handle only raw goods, knowing she could never make a masterpiece. One day in early spring, Carlin was wandering through the warehouses , enjoying the silence and peace of empty rooms. As she wandered, she came into a room of old crates, thickly coated with dust. She ran her fingers over the boards. No, there was no strength left in this wood. Perhaps they could use it for the mushroom beds. She’d have someone come back later with a wheelbarrow. One of the crates had already broken, leaving a hole large enough for Carlin to reach inside. Instead of dust and mouse bedding, her fingers felt a rough burlap cloth wrapped around something. She carefully pulled it out, letting the cloth drop to the group. It was mostly round, but with a narrow, oblong shape at one end. “A handle?” It did resemble a handle, but to what? The round bit was too large to be a spoon, even for stirring. She turned it over. The front was tarnished silver, but the other side had only a thin band of silver along the edge. Instead, it glistened in the dark room, reflecting light from the high windows. Carlin resolved to take it home and see if any of the Handsmen knew of it. Now, many merchants made the long and difficult journey to Atelier, the city of the Handsmen, drawn by rumors of marvels: tapestries that changed from spring blossoms to autumn leaves, plows that left ankle-high wheat in their wake, bowls that boiled stews from rock. The guest houses and stables of Atelier were always full, loaded with the finest goods of distant lands. When the doors of the Great Hall opened, the traders would begin to wheel in their goods. As they passed the first table, they gaped. At the second, they stared. At the third, they wept, for never before had they seen such beauty. No merchant ever made it to the center of the hall, but left in haste and shame. In their haste to be gone, sometimes things were forgotten, only to be found many years later. That evening, as the Handsman Melody sang, Carlin carefully polished the strange item. As she blew off the dirt, it shone more brilliantly, reflecting the many torches and the last of the light through the open windows. When she looked down, she saw a face staring back. I grimaced at the smell of the glass which had just been electrified, and smells horrible, like burnt rubber. We make it from sand. I couldn’t wait to get out of the factory, and get home to my foster parents, although it isn’t much better than the factory. “Matthias! Get back to work!” My boss yelled at me, spit flying everywhere. I sighed, looking at the huge clock on the wall. Ten twenty-nine, which means one more minute ’til I get out of the dusty, dark factory where I work. My job is to cut the sheets of glass that the others electrify. I jumped. I’m still not used to the alarm, and I’ve been working here since I was ten, which is about seven years. “Whoa!” I yelled when someone pushed me into the black wall on my way out, probably trying to get out of the dreary place. We built it over a small portion of the beach. Everything here is black, even the windows. They are black from the charcoal that comes from all the electricity. I arrived home and began sneaking in, trying not to let anyone know I was here. Acerbus and Ater have a birth kid, Nox, too, and spoil him with treats and toys and such. Unfortunately, Nox jumped out from behind the door and started electrocuting me. “Eh-eh-eh-eh!” I made a weird sound while I bounced up and down, trying to stop my foster brother. “S-s-stop I-it!” I yelled, electrocuting him back. “Matthias! I’m ashamed of you! Electrocuting poor Nox!” Ater exclaimed, cuddling Nox like he hadn’t just zapped me himself. “But-” I tried, but she wouldn’t have it. “I don’t wanna hear it. Go to your room!” I growled, making sure to stomp extra loud up the swirly yellow stairs. Really? I thought. I sighed, flopping on my bed. Actually, its more of a cot, which is probably good, since my bed is more of a closet, the exact opposite of Nox’s. His room is ginormous and bright. My room also has a tiny window that shows part of a tree. I wonder what the rest would say if it wasn’t ripped. I pocketed the slip of paper, heading back to my room. I hear some scuffling, like she is getting her glass out. Our glass isn’t always normal glass, it can be anything like something to communicate with, to read with, or to write in. “King Malum, the great and mighty dark Lord, we have found an elf from your prophesy. We would be willing to trade him for some coins.” Definitely Acerbus. But who are they talking about? Prophecy? What prophecy? The one I found? “Finally you notify me! I was about to come over there, and that would NOT have been pleasant. When you bring him here, I will give you anything you desire.” Who is THAT? I went further down the stairs, trying not to let it creak. I saw Ater and Acerbus crowding around their glass. I gasped, running back up the stairs while trying to step over the squeaking parts. SQUEEEEAK! “Matthias, is that you?” Oh, great. Now I’m going to be taken to an unknown man, who wants to use me for some prophesy-thing that I have no clue about. What is going on? I’m not sticking around for this. I kept running, grabbing my small bag from its hiding spot underneath my cot, opening the window, vaulting over the side of it and into the tree, and climbing down as fast as I could. “Matthias! GET BACK HERE!” Ater and Acerbus screamed. I paid no attention, jumping over the fence, and sprinting towards the forest and out of sight. I’ve always been a fast runner, so I lost them pretty quickly, hopping into a bush. “I think he went this way!” I’m pretty sure that was Nox. “No, he went this way!” For a second the voices came closer to me, while my heart pounded so hard in my chest I thought they would hear it and come over. I let out the breath I didn’t realize I was holding, then waited about half an hour before I got out. I glanced back at the city I had lived in since I was born, watching the frequent lightning bolts light up the yellow towers and houses and hearing the waves slap against the beach. Exhaling, I turned and ran the opposite way. I’m going to miss this place. I am at a conference, so I won’t be able to critique these submissions until next week. I hope others will jump in and help until I can get to it. I really like your story; your narration has good pace and your descriptions are vivid. A few suggestions I have to make it even better. The sixth paragraph switches to third person limited from third person omniscient. It was a smooth transition (I wasn’t terribly jarred at all), but after a few more paragraphs you switch back to third person omniscient. That transition was a little more jarring; is there a was you could stick with one or the other? Also (earlier on) when you talk about Yew’s family; when you talk about his wife and how she died it was well done and it didn’t feel like an info dump. Could you though keep the information about Carlin’s brother for later? I think information would work even better later on. If this is the start of the story, I would suggest changing some of the elements. Not much happens until several paragraphs have passed, and at the beginning of a book, it’s important to grab a reader’s attention. The beautiful writing made it easy to read, but it was backstory that I think would fit better later on. Consider introducing the main character (seems to be Carlin) sooner. Without a POV to focus on, I felt slightly disconnected to the story as a reader, more as if I was reading a historical account. I also agree with the point M. Esslinger made about the POV transitions. The end of the last paragraph was intriguing, especially if the face Carlin sees isn’t hers. That would be an interesting hook that could go nearer the beginning to grab the reader’s attention. I found your story very interesting, especially when you mentioned Matthias being part of the prophecy. Also, I love the name Matthias. 🙂 My first suggestion is that you seem to be switching tense from past to present pretty often. You’re going to want to decide on one or the other, since switching tenses makes it harder to read. Also, I forget at which exact part, but you say I hear, which would be unnecessary for first person. You could take that out. Also, I think the story moved a little fast. You could probably slow down and take your time to introduce the characters. For this, you may want to put I growled… in a new paragraph, and possibly signify who was really saying “I don’t wanna hear it. Go to your room!” Right now, it looks like Matthias is saying it to himself. Overall, I thought it was an interesting piece, and I’d like to learn more about the prophecy. Keep writing! I love the name Matthias too! And Tobias, and Alex…Thank you for taking time to critique my story. You were making one mistake in the beginning of this piece that I caught onto right away, and that is tense change. There are two different types of first person POV. There’s present tense, and then there’s past tense. You switched from past to present many times throughout the story. Phrases like “I hear, I smell,” are all present tense. Past tense would be “I heard, I smelled,” essentially. For example: “I grimaced at the smell of the glass which had just been electrified, and smells horrible, like burnt rubber.” In the first part of this sentence, you were writing in past, but once you got to “smells”, it switched to present. In this instance, you would just need to switch “smells” to “smelled”. The rest of the piece, despite a few other tense errors, is written in past. I suggest that you pick either past or present and stick with it. In the opening line, I don’t think you need the “we make it from sand”. It just kind of seems thrown in there, out of place, to tell us how the glass is made. The same goes for “My job is to cut the sheets of glass that the others electrify”. Chances are, if Matthias has worked there for so long, he wouldn’t be thinking about what his job is. You don’t need to dump information like this in the beginning of the story. Also, I would think that yes, he would be used to the alarm. He’s worked there seven years. That’s enough time to get used to it. That’s just my opinion, however. Another thing I noticed was that you spelled prophecy as “prophesy” a few times. As far as I know, prophecy is always spelled with a “c”. Not with an s.
One last thing. Many of your sentences start with “I”. It’s okay to do this, but you want to spice it up a bit by starting with other words. It’s hard not to do in first person, but it’ll get easier as you go along and learn. Prophecy is the noun. Prophesy is the verb. Oh, right. But still, he used the two spellings as if they were the same word. Silvered by Julie: I think there’s some pretty good description in this piece and the world seems very interesting. I can tell you’ve spent a lot of time on it. But I think this piece could be better. The beginning seems to be a large infodump. You show a lot of background, I’m not sure we need to know at this time. I think it would become more real if you showed this world and its background instead of telling it. I didn’t start getting truly interested until Carlin came in with her eyesight problem and I can see a lot of conflict there. That’s good, but it would be great if you could give her more of a goal. I’m also not sure what point of view this is in considering you have some headhopping. Is this third person omniscient or supposed to be third person limited? The prose is also a bit choppy. I think you could smooth it out for easier reading. I like the twist at the end with the face staring back. This sounds like an interesting concept. It just needs more work. Getting critique is a big step to improving. Elf Story by I Am Thor: There are some neat bits about this piece. The electricity powers seem neat and the mean foster parents turning him over to the bad guy seems like it has potential. I think it still needs some improvements though. There is a good amount of telling and prose seems a little choppy. “Heard some scuffling” is telling. You don’t need the word “heard.” Caps aren’t recommended. Try using italics if you can especially with the onomatopoeia. You did a good job establishing the POV character’s name quickly, but some of the other sections of dialogue need some work. For example a lot of seems contrived. Can you make it sound more natural? Also I got confused about who was speaking during the King Malum part. Who was speaking in the italics? Was it Matthias thinking? If so it needs to be on a separate line and preferably with some action beat to clarify. Also Matthias’ dialogue needs to be on the same line during the electricity part. There also are few things that I’m not sure are realistic. Does spit really fly everywhere? Everywhere? Why is he not used to the alarm after seven years? Most people would be. Does he always go through his parents stuff? Wouldn’t he be afraid that he’d get caught with the scrap of paper? Wouldn’t it have been better if he’d copied the poem? Matthias recovered really fast from the electricity. Is this normal? Why would he miss his home? It seemed like a pretty unhappy place. Does he have friends there? Can we meet them? Also the foster parents give up really fast when looking for Matthias. If they want the money so bad, shouldn’t they pursue him more? It could make the scene more exciting. Also could they want to hand him over for more than money? That seems a bit shallow. Do they get a place in the bad guy’s army perhaps? And is Matthias supposed to be so agile he can just leap to a tree from his window? I think the world is neat from what I could see it, but since it is completely foreign to the reader you need to describe it more before you have all of this happen to the main character. Like how did he get home? What kind of transportation do they have? Does everyone have electricity powers? How do they make them work? Is Matthias older or younger than Nox? If he is older (which is what I gathered), how can Nox so easily overpower him? How did he try to make him stop hurting him? You’re welcome. 🙂 It depends on your age, but I know a teen writer group that could offer you some critique. How long is the story? Oh cool. Are you a teen and do you have Facebook? I’m not sure if I can help you right now, but there’s a great Facebook group for teens that could help you out if you’re in that age range. Well, the thing about the group is they check the age of the person to make sure that they are the correct age to get in. I’m suggesting the group because I’m not sure if I have time to critique your story, but somewhere there might. I highly recommend this group for young writers. It’s called Go Teen Writers. They also have a blog with a lot of helpful tips. They’re a great community and I think you would benefit from it. Just a note: I was going for a narrated tone for my story, like a traditional fairy tale, so some of the backstory-drop is deliberate. I agree that your narrator style allows for your back-story elements. Wow, you have created such a fun world. The imagery of elemental Elves working with electricity and glass is beautiful! As far as your writing craft goes, I did not notice any POV hopping. I stayed in Matthias’s head the whole story, and that is something many writers have trouble with. Bravo! Let me echo what the others said; you do seem to struggle with past/present tense switches. Getting very good at writing tenses correctly is one mark of a skilled writer. You can do it! Overall, I feel that the story deserves more of your attention. It’s just too rushed. I want to discover Matthias’s world for myself, not have him tell me everything. If I were a visitor to Matthias’s home, he would not have to tell me that his parents spoil Nox with toys and candy. I could see that Nox is a spoiled brat simply because of the way he acts. The story would be better if it spent more time showing what is happening rather than telling. You did show when you introduced Malum — I discovered that a dark lord exists when it came out in the story. Matthias did not explain him. I just found out about him because the parents mentioned him. That is showing. Do it more and the story will flow. Try visualizing each scene like a movie. Matthias is working in a glass factory. His job is to cut the glass that the other Elves bring him, but he would not look at the camera and describe his job to the audience, right? What if the opening of Star Wars: Episode VI was Luke Skywalker saying, “I live on this moisture farm, but I don’t like it and I’d like to go to Tosche and have adventures?” Instead, we learn about Luke’s life just by watching what he does and how he interacts with the people around him. Let us learn about your Elves by watching what they do. How does Matthias cut the glass? Does he talk to the Elves who bring it to him? Does he have any friends at work? I thought the language and description was very good. I am not quite sure what the genre is, but in most modern books, you want to reveal the main character in the first paragraph, or even the first sentence. If you’re going for a style that’s not used much in the genre you’re writing, you’ll need to be pretty careful, since readers unfamiliar with this style might have trouble with it. I enjoyed the lovely language in your piece. You employed vivid words that created stunning visuals. Nicely done. It’s clear that you are using a narrator, omniscient point of view. That’s fine for creating a fairy-tail-like atmosphere, but such a style often causes an author to use passive or lackluster verb phrasing. I counted 13 uses of “was” and 5 uses of “were” which indicates weak action phrases. Also, try for more specific visuals. It’s possible to employ a narrator style while avoiding weak or passive verbs. For example, here is a rewrite of your first paragraph using active verbs and more visual, specific wording. Once, many years ago, long before you or your mother or your grandmother ever took a breath, a distant realm flourished, filled with wondrous beauty. Shining waterfalls cascaded from towering cliffs. Emerald forests washed the flatlands with lush foliage. Ocean waves crashed onto beaches of rocks, sand, and shells. Mountains ruled in a majestic ring around meadows and glades, providing peek-a-boo views of sunrises and sunsets. And the beasts of that land, though no more magical than those you and I see every day, ran like the wind, bearing faces of nobility and showing friendship to all who displayed kindness. I trust that you can see that the phrasing is more active and vivid this way. In the remainder of your piece, your verb choices are not as weak as in the first paragraph. I suggest scouring it for passivity and lack of vividness. I noticed “was wandering” and “came into a room,” both of which can be made more vivid and specific. Also, make sure the characters are motivated to do what they do. I wondered why Carlin decided to reach inside the hole. I saw no reason for that action. I also wondered why so many merchants continued coming to Atelier. If they heard about the marvels, they would also hear that previous merchants left in shame. Why make such a long and difficult journey. Did they somehow believe that their own goods would fare better than the many other disappointed merchants before them? Overall, you have done a great job. Your writing is lovely. Just work on activating the verb phrasing and ensuring the actions are motivated. It is clear that you enjoy action and exclamatory dialogue. Your writing is infused with fun. Others have already commented on issues I would raise, so I won’t repeat those. Watch for putting your reactions before the stimulus. For example, “I grimaced at the smell of the glass which had just been electrified, and smells horrible, like burnt rubber.” You show the reaction (grimacing) before the reason for the reaction (the smell). This is the wrong order. What is “it”? The closest antecedent is “rubber.” The reader has to go back pretty far to find “glass,” which, I assume, is what you meant. Since your character is well acquainted with the process, I don’t think he or she would mention this tidbit at this moment. Next: I couldn’t wait to get out of the factory, and get home to my foster parents, although it isn’t much better than the factory. I don’t see why a bad smell would raise this reaction. I would add a couple of more negatives and then show this desire to leave rather than simply telling it. I would also wait until the character’s arrival at home to show that home isn’t much better than the factory. Let the readers experience each place and make the comparison themselves. Next: “Matthias! Get back to work!” My boss yelled at me, spit flying everywhere. Since “my boss yelled at me” is a speaker tag, the M should be lower case. Can you give one visual description of the boss? How far away is he or she? Spit would be less noticeable from far away. Readers need some perspective. Next: My job is to cut the sheets of glass that the others electrify. This is an off-the-cuff remark that seems like a narrator talking to the readers. Why would the character bring this up at this moment? I don’t see a motivation. Next: I’ve been working here since I was ten, which is about seven years. This is more narrator prose. Next: “Whoa!” I yelled when someone pushed me into the black wall on my way out, probably trying to get out of the dreary place. You put the reaction (Whoa!) before the reason for the action. Reverse the order. Next: We built it over a small portion of the beach. Everything here is black, even the windows. They are black from the charcoal that comes from all the electricity. This is more narrator prose. You need to bring these facts out through the action. Maybe when the character leaves, he or she can get choked up by the smoke, kick up dirty sand on the beach, or wipe soot from his or her glasses. Next: I arrived home and began sneaking in, trying not to let anyone know I was here. Acerbus and Ater have a birth kid, Nox, too, and spoil him with treats and toys and such. Unfortunately, Nox jumped out from behind the door and started electrocuting me. You’re going too fast. Show readers a bit of the home first, what it looks like to sneak in, quiet footsteps. Don’t just tell us about the family situation. Let it come out through the action. How does he electrocute? This needs to be shown, because readers have no idea how this works. Next: “Eh-eh-eh-eh!” I made a weird sound while I bounced up and down, trying to stop my foster brother. “S-s-stop I-it!” I yelled, electrocuting him back. In what way is he or she trying to stop the brother? Show this. Next: “Matthias! I’m ashamed of you! Electrocuting poor Nox!” Ater exclaimed, cuddling Nox like he hadn’t just zapped me himself. Put the speaker tag (Ater exclaimed) as early as possible so readers will know who is talking. Also give at least one descriptor and visual to show Ater and the cuddling. Next: “But-” I tried, but she wouldn’t have it. You tell that she wouldn’t have it, then you show it. You don’t need both. I don’t want to be repetitive, so I will summarize for the rest of the piece. You need to do more showing instead of telling. Provide more visuals. Eliminate the narrator asides. Slow down and take time to develop each portion. In the first paragraph, you mention the people waking from their long slumber. You might want to mention first that they were sleeping, and possibly provide a reason as to why they were sleeping, unless you want that to be a mystery solved within the course of the story. Later, you have three paragraphs that are from Carlin’s POV, rather than the mysterious storyteller’s POV like the rest of it is. Maybe make those few paragraphs sound a little more like a story being told, unless you want to completely change the POV of the story. Other than that, your story seems amazing! When you finish writing the rest of it, let me know!